Methods: Patients with active rheumatoid arthritis taking MTX ⩾12.5 mg/week for ⩾3 months were included in this 16 week, randomised, open-label study. Patients were randomly assigned to either ETN (25 mg subcutaneous injection twice weekly) added to the baseline dose of MTX or ETN monotherapy. Results: 315 patients were randomised to ETN (n = 160) or ETN plus MTX (n = 155). The primary end point, DAS28 (4) improvement of >1.2 units, was achieved by 72.8% and 75.2% of patients treated with ETN and those treated with ETN plus MTX, respectively, with no significant difference (p = 0.658) between the two groups. The European League Against Rheumatism response criteria of good or moderate response was attained by 80.0% of patients in the ETN group and by 82.4% of patients in the ETN plus MTX group. American College of Rheumatology 20%, 50% and 70% response rates achieved by both groups were also similar: 71.0% v 67.1%, 41.9% v 40.1% and 17.4% v 18.4%, respectively. The rates of adverse and serious adverse events were similar between the treatment groups. Conclusion: Both the addition of ETN to MTX and the substitution of ETN for MTX in patients with rheumatoid arthritis who had an inadequate response to MTX resulted in substantial improvements in clinical signs and symptoms and were generally well-tolerated treatment strategies for improving clinical signs and symptoms of rheumatoid arthritis. The sustained efficacy and safety of etanercept (ETN), a tumour necrosis factor α (TNFα) receptor antagonist, has been well documented in patients with active rheumatoid arthritis.4–8 A previous study in patients with rheumatoid arthritis with an inadequate response to prior MTX monotherapy showed that the addition of ETN to MTX treatment resulted in a significantly greater clinical improvement than treatment with MTX alone.5 In the second study, the absence of an ETN monotherapy group did not allow for the full evaluation of therapeutic strategies for patients having an inadequate response to MTX monotherapy. This study was not designed to differentiate between those patients who had partial responses to MTX monotherapy and those who were non-responders. The purpose of the Add Enbrel or Replace Methotrexate (ADORE) study was to evaluate the efficacy and safety of ETN alone compared with combination ETN and MTX treatment in patients with an inadequate response to MTX monotherapy. This prospective, 16 week, randomised, open-label, parallel-group, outpatient study was conducted at 60 centres in eight countries (Denmark, Finland, France, Germany, The Netherlands, Turkey, UK and Spain) between March 2003 and May 2004. The study protocol was approved by an institutional review board or ethics committee in each country. All patients provided written, informed consent. Patients had to be at least 18 years of age, have active rheumatoid arthritis, be in American College of Rheumatology (ACR) functional class I–III and have been receiving MTX ⩾12.5 mg/week for a minimum of 3 months at a stable dose for at least 6 weeks at the time of study enrolment. All patients must have been at least 16 years of age at the onset of rheumatoid arthritis, must not have used any DMARDs other than MTX within 12 weeks of screening, and must have had inadequate control of rheumatoid arthritis symptoms while on MTX treatment as defined by the presence of Disease Activity Score-28 joint count (DAS28) ⩾3.2 or a combination of ⩾5 swollen joints, ⩾5 painful joints and an erythrocyte sedimentation rate (ESR) ⩾10 mm/h. The ESR ⩾10 mm/h was selected to ensure a DAS ⩾3.2 if the investigator used only swollen and tender joints to enrol patients in the study. Patients who required concurrent use of prednisone >10 mg/day, or its equivalent, were excluded from study entry. Other exclusion criteria were presence of known relevant concurrent medical diseases, use of bolus corticosteroids within 6 weeks or intra-articular corticosteroid injections within 4 weeks of the screening visit, and previous treatment with ETN or any other biological treatment. Patients were randomly assigned to receive ETN in combination with MTX or ETN alone. 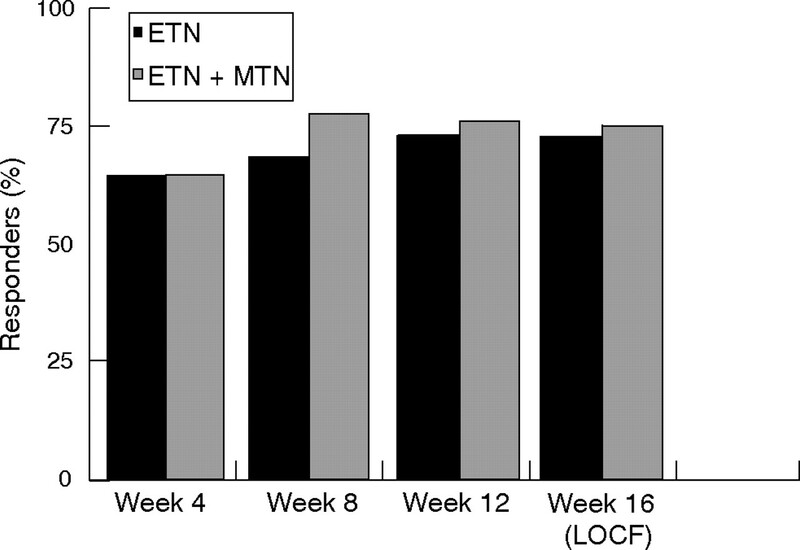 Those patients receiving combination therapy were treated with ETN (25 mg as a subcutaneous injection twice weekly) added to the previously stable baseline dose of MTX (⩾12.5 mg/week orally or by injection). Patients receiving ETN alone were initially treated with ETN concurrently with the previously administered dose of MTX, which was decreased and discontinued over a 4-week period, following which ETN was continued as monotherapy for an additional 12 weeks. Dose reductions of ETN were not permitted during the study. A temporary dose interruption of ETN of ⩽2 weeks was permitted if a mild or moderate toxicity event9 occurred that was not alleviated by therapeutic intervention. A single MTX dose decrease to a minimum of 7.5 mg/week and a dose interruption of ⩽2 weeks were permitted after an adverse event thought to be related to MTX. The primary efficacy measure was the proportion of evaluable patients in each treatment group who achieved an improvement of >1.2 units in DAS28 (4) score from baseline to week 16. DAS28 and ESR were measured at screening, baseline and weeks 4, 8, 12 and 16 (or discontinuation). The DAS28 (4) score is a function of ESR, the patient’s Visual Analogue Scale of General Health (GH VAS), and the number of tender and swollen joints assessed using the 28-joint count method.10 A DAS28 (4) score >5.1 units indicated high disease activity and a score ⩽3.2 units indicated low disease activity.10,11 The baseline DAS28 (4) score and the week 16 DAS28 (4) score were calculated, and the improvement from baseline to week 16 was derived. Secondary end points included the proportion of patients in each treatment group achieving an improvement of >1.2 units in DAS28 (3) score, which is a function of ESR, tender joint count and swollen joint count, but not GH VAS,10,11 from baseline to week 16; time to achieve an improvement in DAS28 (4) >1.2 units; flare of disease at week 4, defined as worsening in DAS28 (4) >0.6 units from baseline to week 4; and clinical remission, defined as DAS28 (4) and DAS28 (3) of <2.6 units at week 16. Additionally, the European League Against Rheumatism (EULAR) response criteria for DAS28 (4) were assessed by using DAS28 (4) at week 16 (last observation carried forward method) and improvements in DAS28 (4) from baseline to week 1612 (table 1). The proportion of patients who achieved improvements in ACR components was also assessed. ACR20, ACR50 and ACR70 response rates were calculated at week 16 (or discontinuation). Safety assessments included analyses of clinical chemistry, blood counts, urine analysis, and vital signs measured at screening, baseline and weeks 4, 8, 12 and 16. Physical examinations were carried out at screening, baseline and final visit. Adverse events and concomitant drugs were recorded throughout the study. The primary analysis was based on the intent-to-treat population. Efficacy analyses included all patients who took the study drugs and had a valid baseline and at least one on-therapy value for each end point. Last observation carried forward values were used for patients who did not complete the scheduled visits. Differences in response between the two groups were evaluated using asymptotic 95% confidence intervals (CIs). Mean changes in baseline of continuous and ordinal secondary efficacy end points were summarised by observed visit and for the last observation through week 16. For mean improvement in DAS28 (4), DAS28 (3) and improvement in all components of the DAS28 and ACR criteria from baseline to week 16, an analysis of covariance was carried out using the baseline value as a covariate. For these end points, treatment differences and 95% CIs were based on the adjusted means from the analysis of covariance models. The primary end point, the DAS28 (4) improvement score, included the GH VAS scale. As it was expected that not all patients would complete this scale, a prespecified sensitivity analysis, the DAS28 (3), which does not require the GH VAS, was added to the analysis plan. The study was powered to characterise the relative efficacy of the two treatments rather than to declare the superiority of either treatment. Assuming that 70% of patients in both treatment groups improved by the DAS criteria, the two-sided 95% confidence limits on the difference would be approximately 10%, with 150 patients per group. A total of 315 patients with active rheumatoid arthritis were randomly assigned to receive study drugs. In all, 160 patients were present in the ETN group and 155 patients in the ETN plus MTX group. One patient in the ETN group did not receive drug and was withdrawn from the study, leaving 314 patients in the intent-to-treat analysis. Demographic and baseline disease characteristics were generally comparable between treatment groups (table 2). Thirty patients (17 in ETN group and 13 in the ETN plus MTX group) were withdrawn from the study (table 3). One patient in the ETN group was classified as a “non-completer” because he stopped taking the study drugs at week 12 but completed the week 16 visit. With regard to concomitant use of other treatments, 74.2% of patients in the ETN group and 81.3% of patients in the ETN plus MTX group used non-steroidal anti-inflammatory drugs; 51.6% in the ETN group and 56.8% in the ETN plus MTX group used corticosteroids. A total of 136 patients in the ETN group and 125 patients in the ETN plus MTX group had data available for the DAS28 (4) analysis. In all, 156 patients in the ETN group and 151 patients in the ETN plus MTX group were included in the DAS28 (3) analysis. The proportion of patients with an improvement in DAS28 (4) of >1.2 units at week 16 was similar between the ETN group and the ETN plus MTX group (72.8% v 75.2%, respectively; difference = −2.4%, 95% CI −13.1% to 8.2%; p = 0.658). The proportion of patients who experienced an improvement of >1.2 units in DAS28 (3) scores was also similar between the ETN group and the ETN plus MTX group (64.7% v 72.8%, respectively; difference = −8.1%, 95% CI −18.4% to 2.2%; p = 0.126). Despite the slightly lower number of patients evaluated for DAS28 (4), the CIs for the difference between DAS28 (4) and DAS28 (3) were approximately −10% to +10%, as specified in the study design. The mean improvement in DAS28 (4) scores from baseline to week 16 was 1.95 units in the group receiving ETN and 2.20 units in the group receiving ETN plus MTX (difference = −0.24, 95% CI −5.5 to 0.08; p = 0.14). The improvement in DAS28 (4) was rapid (as early as 4 weeks) and sustained over the duration of the study. Scores in both treatment groups were comparable at each time point (fig 1). The median time to achieve DAS28 (4) improvement >1.2 units was approximately 32 days for both treatment groups. Percentage of responders (Disease Activity Score-28 joint count (DAS28) (4)>1.2) over time. Last observation carried forward (LOCF) at week 16. ETN, etanercept; MTX, methotrexate. The proportion of patients who experienced an improvement of >1.2 units in DAS28 (3) scores was also similar between the ETN group and the ETN plus MTX group (64.7% v 72.8%, respectively; difference = −8.1%, 95% CI −18.4% to 2.2%; p = 0.13). “Flare” of the disease at week 4, defined as worsening of the DAS28 (4) score to >0.6 units, was not observed in any patients receiving ETN and was observed in only one patient (0.9%) receiving ETN plus MTX treatment. The proportion of patients who experienced a clinical remission as measured by a DAS28 (4) score of <2.6 units at week 16 was similar between the ETN-treated and the ETN plus MTX-treated groups (14.6% v 17.3%, respectively; difference = −2.7%, 95% CI −10.9% to 5.5%; p = 0.52). Similarly, the proportion of patients with a clinical remission as defined by DAS28 (3) score <2.6 units at week 16 was similar between the ETN group and the ETN plus MTX group (15.2% v 15.1%, respectively; difference = 0.1%, 95% CI −7.9% to 8.0%; p = 0.99). The proportion of patients in both treatment groups with a “good” or “moderate” EULAR response at week 16 was similar: 80.0% in the ETN group compared with 82.4% in the ETN plus MTX group. We found no significant difference in the proportion of patients achieving ACR20, ACR50 and ACR70 response criteria at week 16 between the treatment groups (fig 2). The proportion of patients who achieved ACR20 was 71.0% and 67.1% in the ETN group and the ETN plus MTX group, respectively (difference = 3.9%, 95% CI −6.4% to 14.2%; p = 0.46). 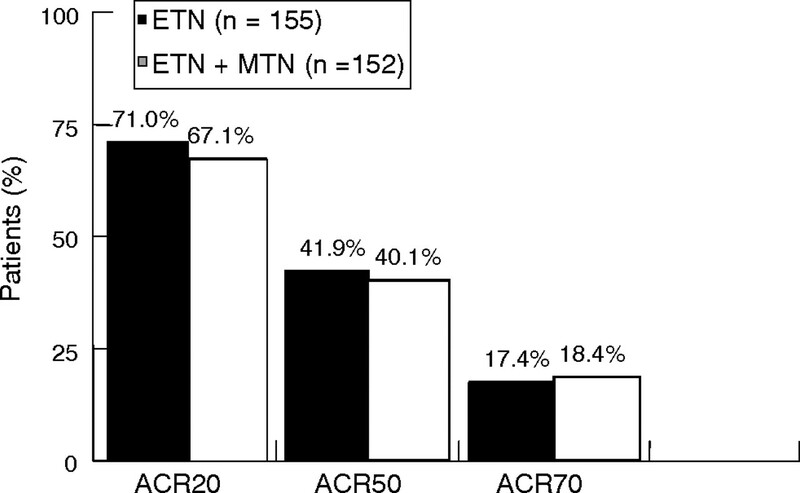 The proportion of patients who achieved ACR50 was 41.9% in the ETN group and 40.1% in the ETN plus MTX group (difference = 1.8%, 95% CI −9.2% to 12.8%; p = 0.75). The corresponding proportion of patients in each group who achieved ACR70 was 17.4% and 18.4%, respectively (difference = −1.0%, 95% CI −9.6% to 7.6%; p = 0.82). Final mean ESR was 26.4 mm/h in the ETN group and 20.8 mm/h in the ETN plus MTX group, which reflects a significant mean improvement of 7.8 and 14.6 mm/h, respectively (difference = −6.1, 95% CI −9.6 to −2.7; p = 0.001). Proportion of patients achieving American College of Rheumatology (ACR)20, ACR50 and ACR70 at week 16 (last observation carried forward). ETN, etanercept; MTX, methotrexate. One or more adverse events were experienced by 62.9% (100/159) of the ETN group compared with 70.3% (109/155) of the ETN plus MTX group (table 4). The most frequently reported adverse event in the ETN group was headache, experienced by 14 patients (8.8%), and that in the ETN plus MTX group was nasopharyngitis, experienced by 20 patients (12.9%). Most adverse events were mild to moderate in intensity in both groups. A total of 15 patients (4.8%) experienced one or more serious adverse events during this study. Eight patients (5.0%) experienced 13 serious adverse events in the ETN group, and 7 patients (4.5%) experienced 8 serious adverse events in the ETN plus MTX group. These events represented various organ systems and did not indicate clustering of any single event. None of the serious adverse events were considered to be related to ETN or MTX, with the exception of three events in two patients (one patient from each treatment group). One case of dizziness and one case of blurred vision in the same patient were considered to be related to ETN, although these were not considered by the investigator to be due to demyelinating disease. One case of dyspnoea was considered to be related to ETN plus MTX treatment. No cases of tuberculosis, opportunist infections or deaths were reported in the ETN group. Three deaths were reported in the ETN plus MTX group, one of which was due to a cardiac arrhythmia that occurred 1 month after the patient discontinued study drugs, another was due to cardiac arrest and the third was due to a massive cerebral haemorrhage. All the deaths in this group were considered to be unrelated to study drugs by the investigator. Non-biological DMARDs, such as sulfasalazine, hydroxychloroquine and MTX, are often used as initial treatment in patients with rheumatoid arthritis. Unfortunately, many patients on these drugs do not achieve an adequate response or cannot maintain a therapeutic response due to toxicity. The question often arises as to whether one should add or substitute an anti-TNF agent.5,8 This study was initiated to help answer this question with the use of ETN. It has been shown that patients with rheumatoid arthritis who had not been previously exposed to MTX or who had not failed to respond to MTX had greater clinical and radiographic responses to combination ETN and MTX treatment compared with either ETN or MTX monotherapy (Trial of Etanercept and Methotrexate with radiographic Patient Outcomes (TEMPO)).4 It has also been shown clinically that combination therapy was better than MTX plus placebo in patients who had experienced an inadequate response to MTX.5 In the study of inadequate responders to MTX, there was no ETN monotherapy arm, leaving unanswered the question of whether there was an added benefit of using combination therapy as opposed to ETN alone. Results from this open-label study indicated that, in these patients, the improvement seen when adding ETN was principally a function of ETN alone and not of the combination with MTX. The clinical responses as measured by DAS>1.2, change in DAS, DAS remission rates and ACR scores were similar for the patients treated with either ETN monotherapy or combination therapy. The results showed that >70% of patients in this study met the primary end point of a DAS28 improvement >1.2, representing at least a moderate EULAR response. This response was rapid, occurring within approximately 1 month, and was sustained for the next 3 months. The lack of disease flare on tapering of MTX in the ETN monotherapy group was consistent with the rapid response following replacement of MTX by ETN, and supports the treatment option of discontinuing MTX in patients in whom the drug is providing inadequate efficacy. In TEMPO, most patients were MTX-naive (60%) or off MTX for at least 6 months (40%), and were started on ETN or combination therapy earlier than is usually done in clinical practice when patients have often failed at least one DMARD, usually including MTX, before starting anti-TNF treatment. Patients in the ADORE study had already been on MTX treatment at reasonably high doses (median 15 mg/week in ADORE v 10 mg/week in TEMPO at baseline) for at least 3 months and, therefore, more closely resembled patients often seen in clinical practice for whom doctors would consider starting an anti-TNF agent. These differences in the populations may have contributed to the different results seen in the combination therapy groups of the two studies. Whereas the combination of MTX and ETN in patients who were relatively MTX-naive may have been additive, this did not seem to be the case with regard to patients on combination therapy in this study who had inadequate response to MTX. Both regimens in this study were well tolerated during the course of the trial, and treatment with ETN, either alone or in combination with MTX, did not result in any unexpected safety findings compared with previous ETN studies. No cases of tuberculosis, systemic lupus erythematosus or demyelinating disease were reported in the safety database. The incidence of severe infections was small and comparable in both treatment groups (5.0% for ETN and 4.5% for combination therapy). This study may have practical implications for doctors who are confronted with a patient who has an inadequate response to MTX, a situation that often occurs in clinical practice. If the addition of an anti-TNF agent is under consideration, ETN can be added to or substituted for MTX. Furthermore, the discontinuation of MTX does not seem to affect the potent clinical response provided by ETN, nor does it result in flare of disease. The findings of this study may be relevant to patients who have had toxicity or tolerability issues with MTX or to those who have had minimal or no response to MTX, allowing for more flexibility of treatment regimens. In conclusion, this study presents additional data that MTX may be safely replaced by or complemented with ETN in certain patients with rheumatoid arthritis, providing additional clinical improvement over previous MTX treatment. We thank all patients who participated in the trial and all investigators and nursing staff of all participating centres. Alamanos Y, Drosos AA. Epidemiology of adult rheumatoid arthritis. Autoimmun Rev2005;4:130–6. Kremer JM. Methotrexate and emerging therapies. Rheum Dis Clin North Am1998;24:651–8. Klaukka T, Kaarela K. Methotrexate is the leading DMARD in Finland. Ann Rheum Dis2003;62:494–5. Klareskog L, van der Heijde D, de Jager JP, Gough A, Kalden J, Malaise M, et al. Therapeutic effect of the combination of etanercept and methotrexate compared with each treatment alone in patients with rheumatoid arthritis: double-blind randomised controlled trial. Lancet2004;363:675–81. Weinblatt ME, Kremer JM, Bankhurst AD, Bulpitt KJ, Fleischmann RM, Fox RI, et al. A trial of etanercept, a recombinant tumor necrosis factor receptor: Fc fusion protein, in patients with rheumatoid arthritis receiving methotrexate. N Engl J Med1999;340:253–9. Cancer Therapy Evaluation Program. Common terminology criteria for adverse events v3.0 (CTCAE). http://ctep.cancer.gov (accessed 1 Jun 2005). van Riel PL, van Gestel AM, van de Putte LB. Development and validation of response criteria in rheumatoid arthritis: steps towards an international consensus on prognostic markers. Br J Rheumatol1996;35 (Suppl 2) :4–7. van Gestel AM, Prevoo ML, van’t Hof MA, van Rijswijk MH, van de Putte LB, van Riel PL. Development and validation of the European League Against Rheumatism response criteria for rheumatoid arthritis. Comparison with the preliminary American College of Rheumatology and the World Health Organization/International League Against Rheumatism Criteria. Arthritis Rheum1996;39:34–40. Lipsky PE, van der Heijde D, St Clair EW, Furst DE, Breedveld FC, Kalden JR, et al. Infliximab and methotrexate in the treatment of rheumatoid arthritis. N Engl JMed2000;343:1594–602. Weinblatt ME, Keystone EC, Furst DE, Moreland LW, Weisman MH, Birbara CA, et al. Adalimumab, a fully human anti-tumor necrosis factor α monoclonal antibody, for the treatment of rheumatoid arthritis in patients taking concomitant methotrexate. Arthritis Rheum2003;48:35–45. Zhou H, Mayer PR, Wajdula J, Fatenejad S. Unaltered etanercept pharmacokinetics with concurrent methotrexate. J Clin Pharm2004;44:1235–43. Cutolo M, Sulli A, Pizzorni C, Seriolo B, Straub RH. Anti-inflammatory mechanisms of methotrexate in rheumatoid arthritis. Ann Rheum Dis2001;60:729–35. Combe B, Kvien TK, Fatenejad S, Wajdula J. A 2-year double-blind comparison of etanercept (Enbrel®) and sulfasalazine, alone and combined in patients with active rheumatoid arthritis [abstract]. Arthritis Rheum2005;52 (Suppl) :S142. Haagsma CJ, van Riel PLCM, de Jong AJL, van de Putte LBA. Combination of sulphasalazine and methotrexate versus the single components in early rheumatoid arthritis: a randomized, controlled, double-blind, 52 week clinical trial. Br J Rheumatol1997;36:1082–8. Haagsma CJ, Russel FGM, Vree TB, van Riel PLCM, van de Putte LBA. Combination of methotrexate and sulphasalazine in patients with rheumatoid arthritis: pharmacokinetic analysis and relationship to clinical response. Br J ClinPharmacol1996;42:195–200. Molenaar ETH, Voskuyl AE, Dinant HJ, Bezemer PD, Boers M, Dijkmans BAC. Progression of radiologic damage in patients with rheumatoid arthritis in clinical remission. Arthritis Rheum2004;50:36–42. Combe B, Dougados M, Goupille P, Cantagrel A, Eliaou JF, Sibilia J, et al. Prognostic factors for radiographic damage in early rheumatoid arthritis. Arthritis Rheum2001;44:1736–43. Landewé R, van der Heijde D, van Vollenhoven R, Fatenejad S, Klareskog L. A disconnect between inflammation and radiographic progression in patients treated with etanercept plus methotrexate and etanercept alone as compared with methotrexate alone: results from the TEMPO trial [abstract]. Arthritis Rheum2005;52 (Suppl) :S343. Welsing PMJ, van Gestel AM, Swinkels HL, Kiemeney LAML, van Riel PLCM. The relationship between disease activity, joint destruction, and functional capacity over the course of rheumatoid arthritis. Arthritis Rheum2001;44:2009–17. McQueen FM, Benton N, Perry D, Crabbe J, Robinson E, Yeoman S, et al. Bone edema scored on magnetic resonance imaging scans of the dominant carpus at presentation predicts radiographic joint damage of the hands and feet six years later in patients with rheumatoid arthritis. Arthritis Rheum2003;48:1814–27. Welsing PM, Landewe RB, van Riel PL, Boers M, van Gestel AM, van der Linden S, et al. The relationship between disease activity and radiologic progression in patients with rheumatoid arthritis: a longitudinal analysis. Arthritis Rheum2004;50:2082–93. Lindqvist E, Eberhardt K, Bendtzen K, Heinegard D, Saxne T. Prognostic laboratory markers of joint damage in rheumatoid arthritis. Ann Rheum Dis2005;64:196–201. Funding: This study was funded by a research grant from Wyeth Research.